The field of comparative constitutional law has developed in interesting and exciting directions in recent years. 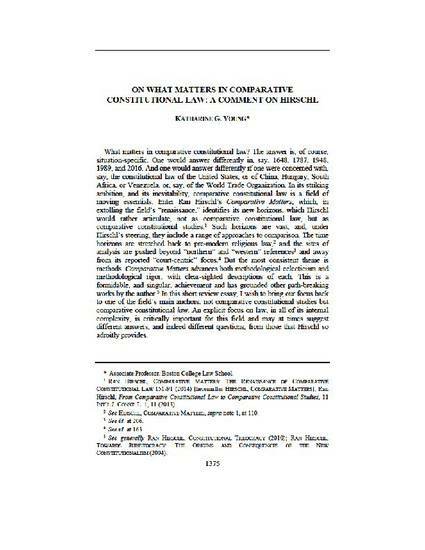 This essay provides a comment on Ran Hirschl’s Comparative Matters: The Renaissance of Comparative Constitutional Law, a path-breaking example of the new methodologies that have become possible in the field. Its new boundaries, described not as comparative constitutional law, but as comparative constitutional studies, include comparative politics, political economy, and the broader social sciences. By contrast, this essay suggests that the field must remain anchored in law, in all of its complexity. This may at times suggest different answers, and indeed different questions, from those that Hirschl provides. Moreover, I argue that the difficult questions that the social practice of law raises – such as the demand for justification, and the reliance on interpretation – cannot be abandoned in this new moment of social scientific possibility.